This little breakfast date with my daughter provided some great memories for me! 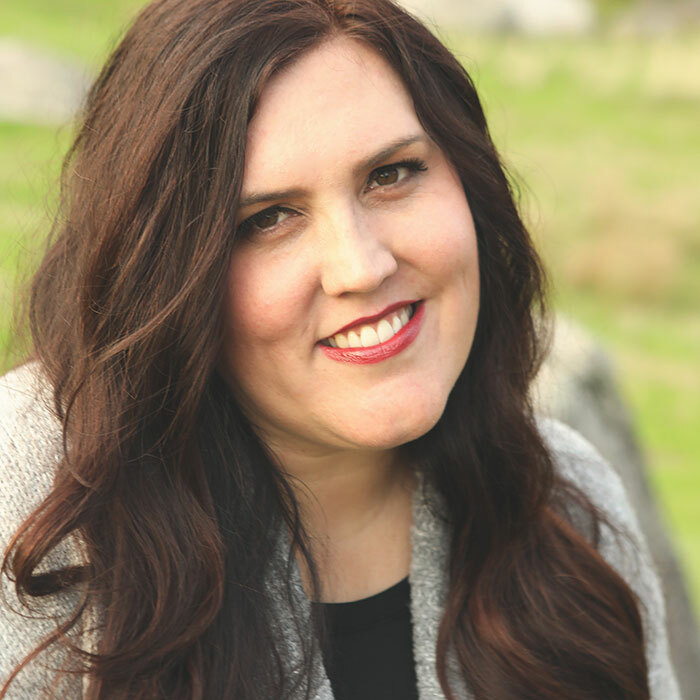 I was lucky to partner up with a great friend of mine and plan activities for the 8-9 year olds in our church group (about 17 girls). This was such a sweet group of girls to work with, I already miss them since I moved! This activity was a special little mommy-daughter date in May (sometime around Mother’s Day). But it was so fun, I would love to do it again, anytime of year! 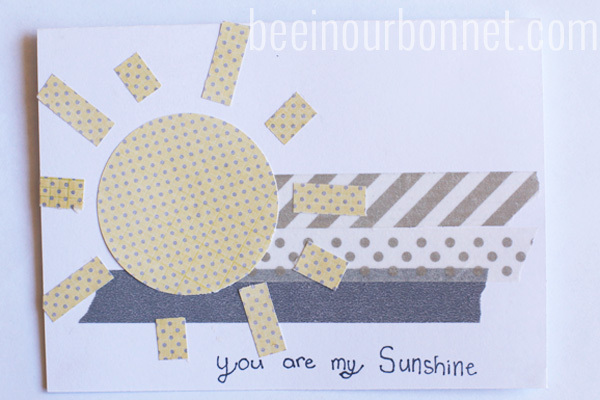 My friend chose the adorable theme: “You are my Sunshine.” That gave us license to use the adorable, and ever trendy yellow and gray color combo. We chose to do a Saturday Morning breakfast because it was something different, and the date worked. You gotta go with it when you can find the right time! We used our whole activity before this to plan and prepare with the girls. 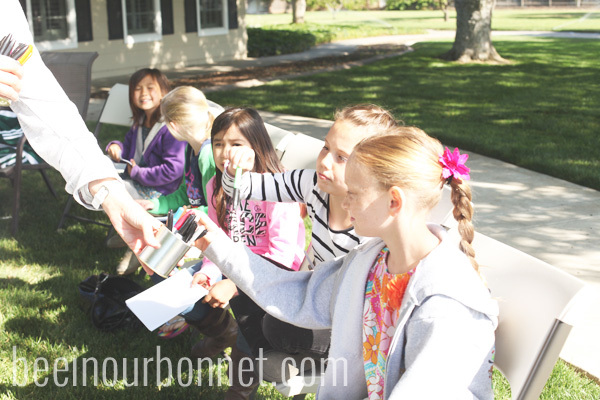 We are training the next generation of party planners, this is serious business! I prepared the bits and pieces to make the invitations. The paper was pre-printed (inside) with the info and the suns were pre-cut. I also had an example for them to follow. I have learned in my years of crafts with kids that it ALWAYS takes longer than you think it will, so any prep work you can do for them will help things along (when you have a time limit). The girls used wash tape, and some glue sticks then wrote their message. 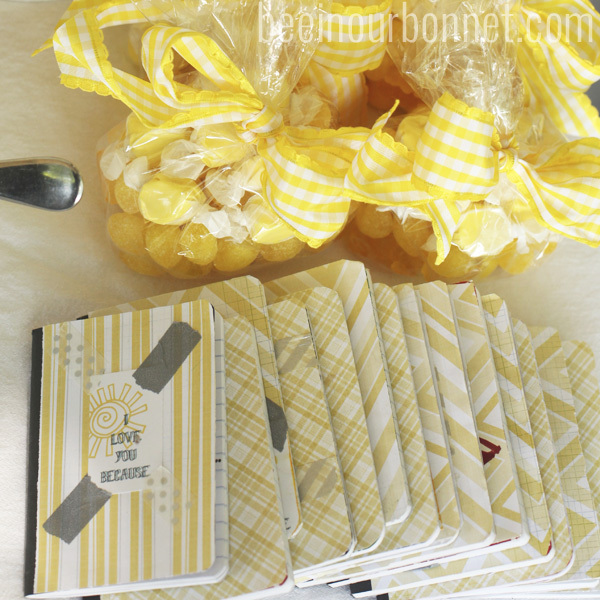 We also made these mini books for their mom’s as their favor. I just let them go at it with the gray and yellow supplies I had on hand. They wrote reasons why they love their mom’s on the pages. They gave the their gift with a bag of yellow candy. Can I just tell you how much I LOVE the bulk bins at Winco. They are now selling candy by the color (gummies, taffies, etc.). The meal wasn’t too fancy but it was also pretty easy. 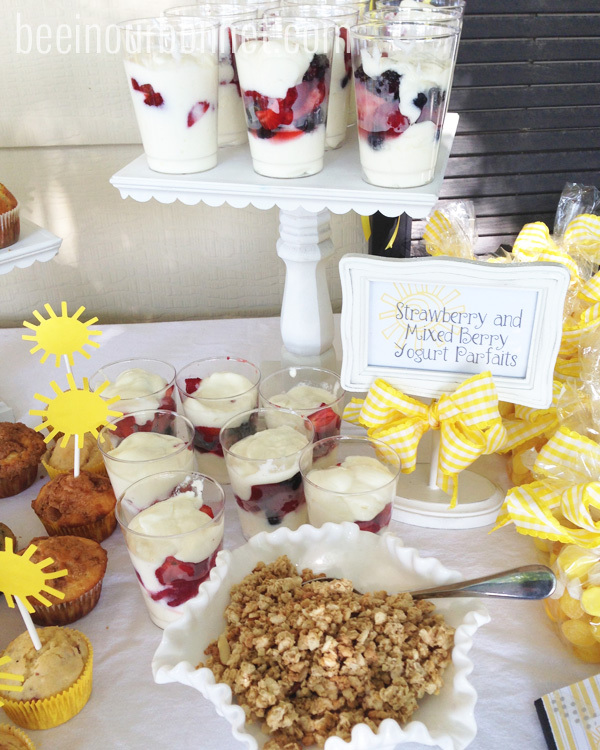 Serving hot breakfasts can get tricky (and slow) with a crowd, so we did most of the work in advance. 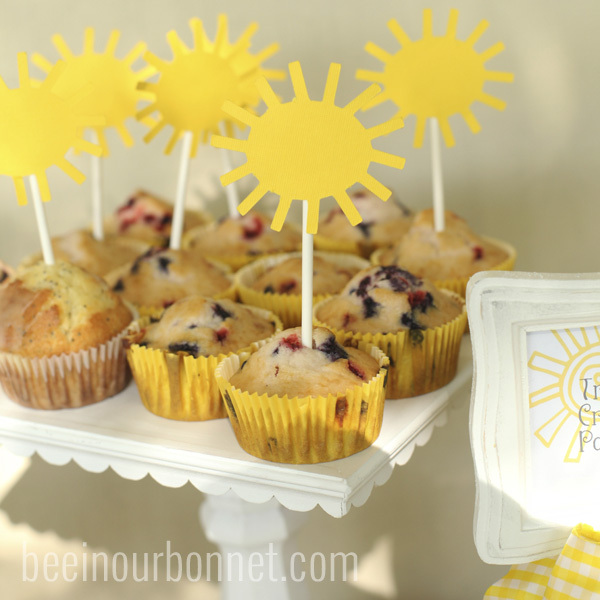 My friend made a great variety of muffins and I made little suns for toppers. I cut them on my cricut then taped them on a stick! Quick and festive, my favorite! I made some homemade yogurt (recipe here) and we filled with delicious berries, most from my friend’s garden! When berries are in season in Cali, it is sort of like heaven. And do you recognize the cake stands? Are you sick of seeing them yet? These things have gotten some milage, I use them for everything! 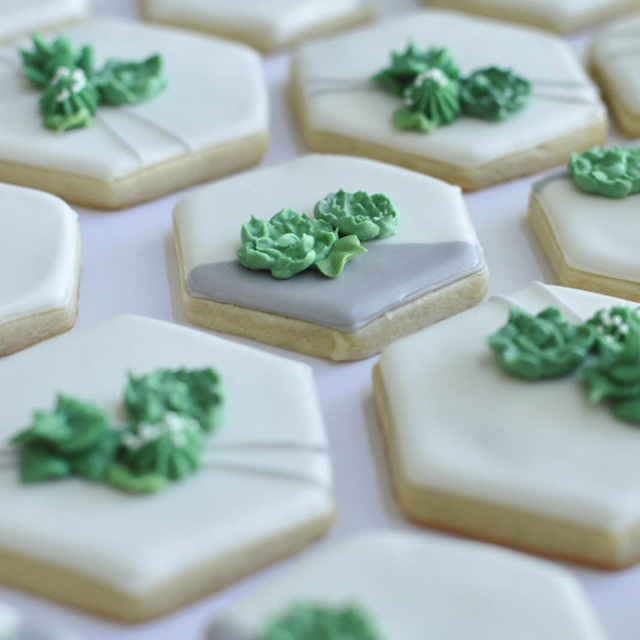 If you want to make your own cake stands, see the tutorial! I initially wanted to make omelets, but again opting for easy, I made some stratas. You make them the day before and just pop them in the oven an hour before. With some egg, yogurt, muffin and juice we were good to go! We didn’t decorate much because my friend’s yard is beautiful enough, but I made some banners to display the theme. 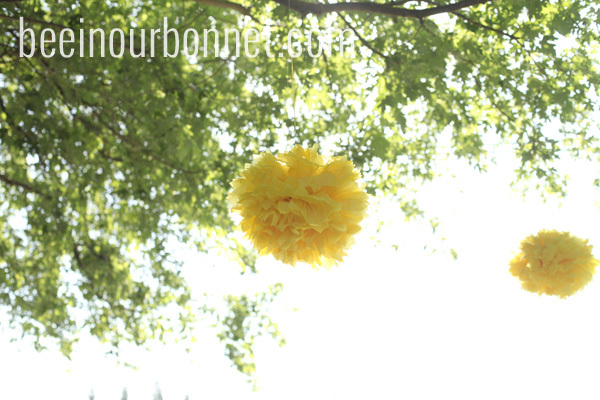 And hanging from the huge trees in her yard were tons of tissue pom poms made by my friend! After the girls served breakfast we played a game. This is when the good times happened. Moms sat on one side and daughters on the other. It was sort of like the newlywed game. We asked them questions and they wrote down what they thought their mom would say. For example, you’re mom’s favorite thing to do in her spare time is… If your mom could go anywhere, where would it be? If your mom was and animal… You get the point. Then we had the mom’s answer the questions verbally as the kids held up their signs and we saw if they matched. Then we played the whole game with moms writing the answers. There were some good laughs during this game and I think it made for a memorable morning! 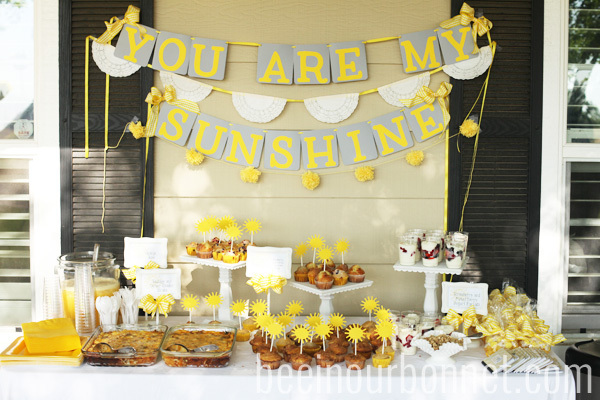 After they were done, they sang, “you are my sunshine” to their moms and gave them their little gift and treat. We loved our mommy-daughter activity so much, we did a daddy-daughter pool party with them a few months later. This was complete with BBQ and a daddy-daughter creative diving and cannon ball contest. Oh man, if only I had video of that one! Well, just use your imagination, it was… good times! What a great event for the moms and daughters! 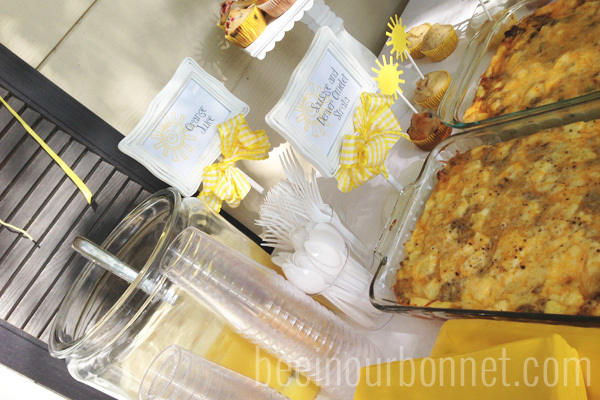 I love everything about the theme, and yellow is such a happy color:) I am going to keep that game in mind when our family gets together~fun! 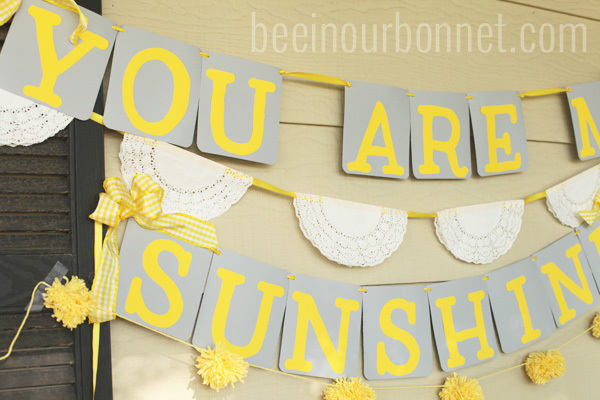 I so love this idea and plan on doing it for our Mother and daughter activity in May. Could I please ask you how you made the booklets for the moms?